Recently, I have encountered a very rare and interesting question: are Havanese loyal? At first, it seems like a no-brainer. Dogs are man’s best friends is the famous quote that everyone knows. Of course all dogs are loyal. Then after I think slightly more deeply, I was starting to think about what loyalty really means and do Havanese really have those qualities. Let’s now explore on this interesting subject. I have tried to find ways to define what loyalty is. The best answer I can come up with is attachment to the owner or to whoever that spend a lot of time taking care of him. So, if a dog follows the owner around closely, say when you are taking a walk and going hiking, the dog is defined as loyal. Most dogs are loyal as we expect. But to rate Havanese among all the dog breeds, Havanese is easily one of the most loyal breeds. They follow their owners very closely. Another character of a loyal dog is the willingness to listen to the owner’s instruction. Let’s look at only dogs that have been trained to listen to some basic instructions. Even when these dogs do understand the instructions, not all of them follow them all the time. For a loyal dog, he should know the importance of following the owner’s instruction. Havanese usually pass this test too. Thousands of years ago, if you are loyal to a king, that usually means that you will respect or take care of the king’s family too. I would like to use this quality as part of the definition for a dog’s loyalty. For example, if a dog is friendly to your kids, it is labelled as being loyal. 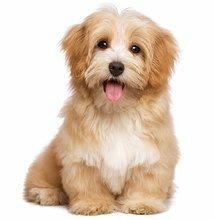 With the cheerful and peaceful character of Havanese, they usually get along with your kids very well. They don’t get aggressive with kids and kids usually love them a lot too. If I am loyal to my king, I definitely won’t mess up his place. When you apply this to the world of Havanese, this is a test that they don’t pass all the time. Yet, they have a reason not to pass the test. Havanese is a breed that has above average high level of energy. If you don’t spend time to help your Havanese to release these energy by walking say 45 minutes or playing, your Havanese’s energy built up. That means that your Havanese has to release his energy in his own way. Well, if you leave him alone at home while his energy is high, a messed-up home is a sure and logical result. Therefore, I won’t say that a Havanese can’t really pass this test. As long as you do your part of giving him enough exercise, your home shouldn’t be messed up as often. Up to this point, you can see that Havanese are very loyal to their owners. Most other dog breeds are generally very loyal too. The theory behind the loyalty between dogs and human is actually quite interesting. If you believe in evolution, it’s not to believe that dogs are just some types of wolves many thousand years ago. Some human began to treat them as pets and the evolution began. If you have to survive, you have to adapt to your environment. “Evolve or die” is basically the central theme of Darwin’s evolution theory. So, let’s say there wear 100 wolves that were treated as pets by human. And let’s assume that 50 of them just happen to be more loyal than the other 50 just by random. The 50 loyal ones very naturally are taken care better and given the chance to have kids. Their kids would very likely carry the loyal gene of their parents. Generations after generations, it is no surprise that these “wolves” are as loyal and as friendly as they are today. Not only that Darwin’s evolution theory can help you understand the reason for the dogs’ loyalty, it can actually help you understand a lot of things in life too. Just research on “natural selection” if you are interested in learning more about life. There are some other factors that make dogs seem more loyal than other pets like cats. There are studies that show that dogs can actually express empathy. In the study, a dog is put in the same room as his owner. When his owner cries, there is obvious action taken by the dog that indicates he is trying to comfort his owner. That makes sense as we know that dogs are loyal to their owners. Now, the test continues. The owner is replaced by a crying stranger. This time, the dog also tries to comfort the stranger. It is a pretty strong evidence that dogs have and can express empathy which make it more believable that dogs’ loyalty really come from their heart and not just some sorts or acting or action in a attempt to get more food. So, knowing that your Havanese is loyal to you is good news and it is no surprise. The really big question that we can instead ask is whether we can be loyal to our Havanese. By being loyal, I mean be good to your Havanese even if you are in a bad mood, or if you are having a busy day, or if you have a new girlfriend and boyfriend just demands a lot of time. Can you do that for months? Can you do that everyday for around 15 years? If you think you can’t, and you are just think about whether to have a Havanese or not, it is a good time to rethink and be realistic. There is nothing wrong with not being able to make a big commitment. Everything is wrong if you made a commitment and not being able to stick to it.